Located west of the historic Heights, Lazybrook is one of the hottest Inner Loop neighborhoods in terms of land value and real estate appreciation. Lazybrook, often tied together with adjoining Timbergrove, is a deed-restricted residential neighborhood. 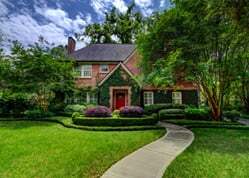 FAST REAL ESTATE GROWTH: Lazybrook real estate are among Houston’s best performing in terms of Land Value Appreciation and Real Estate Value Appreciation. SPACIOUS LOTS: Lazybrook homes typically sit on mid- to large-sized lots (by Houston standards), with sizes ranging from 7,000 to 14,000 square feet. Mature trees and spacious front and back yards are common in the neighborhood. ACTIVE CIVIC CLUB: Founded in 1960, the Lazybrook Civic Club is a volunteer-based group that handles the neighborhood’s security, beautification, maintenance, and events. The club also enforces the neighborhood’s deed restrictions and building restrictions. GREAT COMMUNITY ATMOSPHERE: The neighborhood exudes a quiet suburban atmosphere. Wide setbacks, tree-canopied streets, and well-kept vintage homes adorn the neighborhood. EASY COMMUTES: Located within minutes of several main roads and freeways, Lazybrook homes provide easy access to Houston’s main districts, including downtown, the Galleria, and the Texas Medical Center. Downtown, home to 3,000+ businesses and 100,000+ employees, is less than 20 minutes away. Lazybrook real estate can be challenging to navigate due to several factors, including older homes (some may need extensive renovations), deed restrictions (which can be good or bad depending on your goals), and proximity to main roads and freeways (being too close to one can affect resale values). Another major issue is that some areas in Lazybrook/Timbergrove are right on the flood plain. This can affect insurance costs, resale values, and of course, puts you and your property at risk in case of a flood. 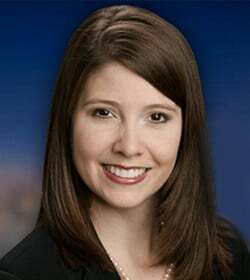 For help buying or selling Lazybrook / Lazybrook homes, contact Paige Martin, one of Houston’s Best Realtors and one of Lazybrook’s most active real estate agents. Enter your email to get this free Lazybrook guide in easy-to-read PDF format. Bonus: Also see how this area compares with nearby top neighborhoods. 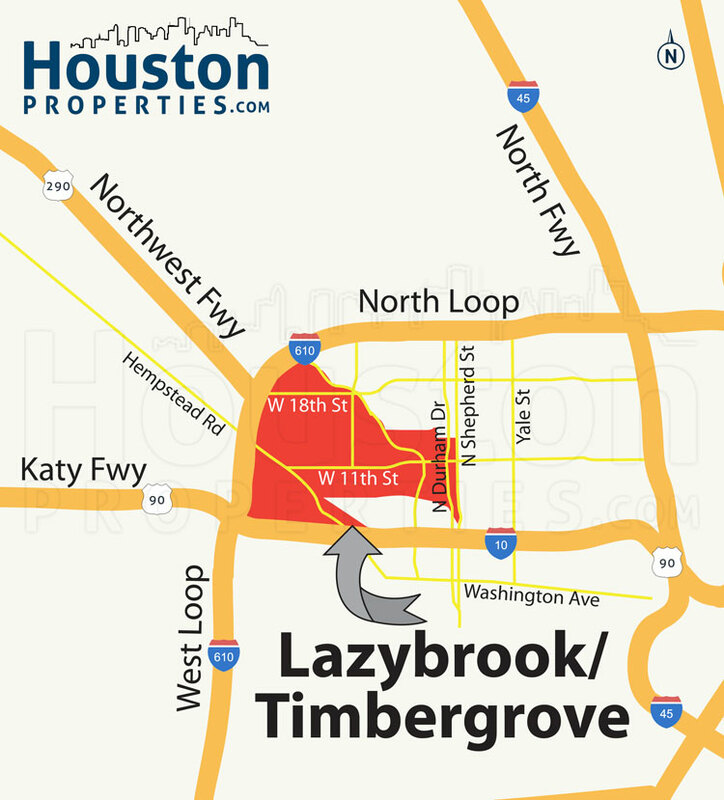 Located at the northwest bend of Loop 610, Lazybrook is a quiet residential neighborhood just north of Timbergrove and west of the historic Heights. 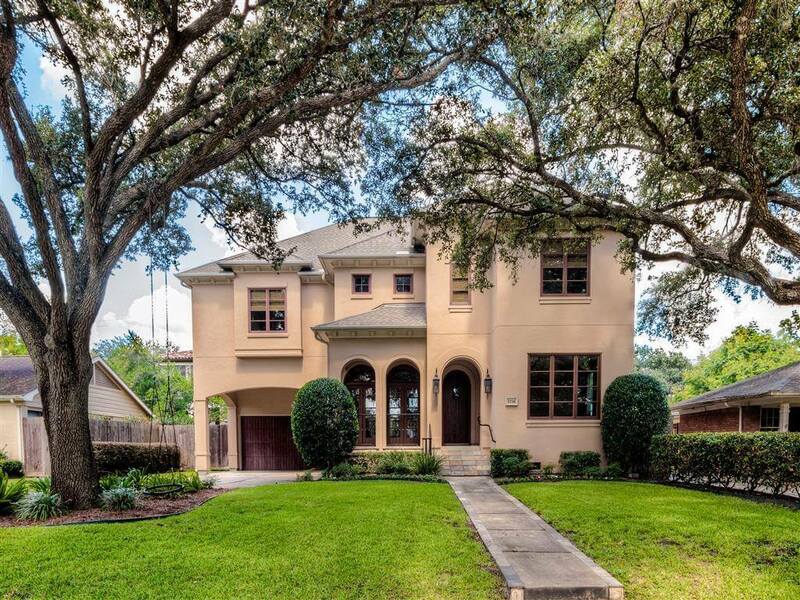 Lazybrook real estate are among Houston’s best performing in terms of Land Value Appreciation and Real Estate Appreciation. 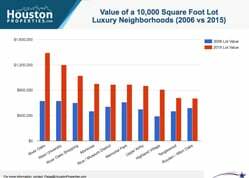 Lazybrook homes typically sit on mid- to large-sized lots (by Houston standards), with sizes ranging from 7,000 to 14,000 square feet. 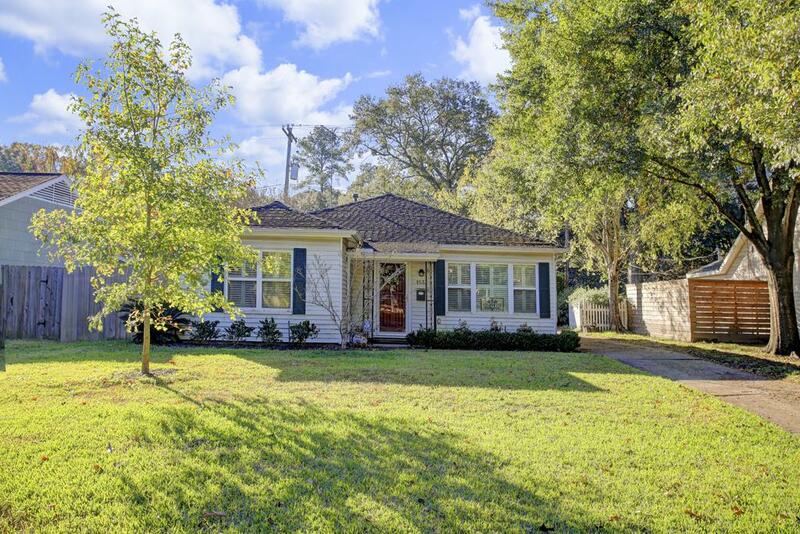 Mature trees and spacious front and back yards are common in the neighborhood. Founded in 1960, the Lazybrook Civic Club is a volunteer-based group that handles the neighborhood’s security, beautification, maintenance, and events. The club also enforces the neighborhood’s deed restrictions and building restrictions. The neighborhood exudes a quiet suburban atmosphere. Wide setbacks, tree-canopied streets, and well-kept vintage homes adorn the neighborhood. 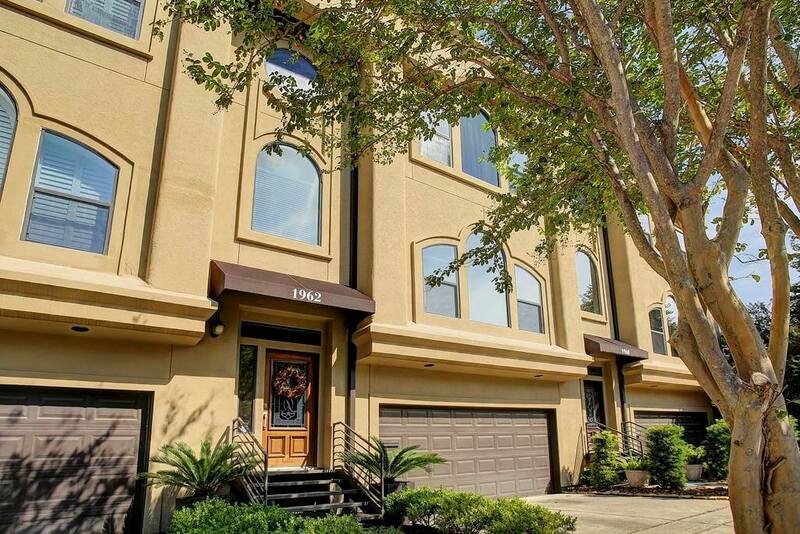 Located within minutes of several main roads and freeways, Lazybrook homes provide easy access to Houston’s main districts, including downtown, the Galleria, and the Texas Medical Center. Downtown, home to 3,000+ businesses and 100,000+ employees, is less than 20 minutes away. 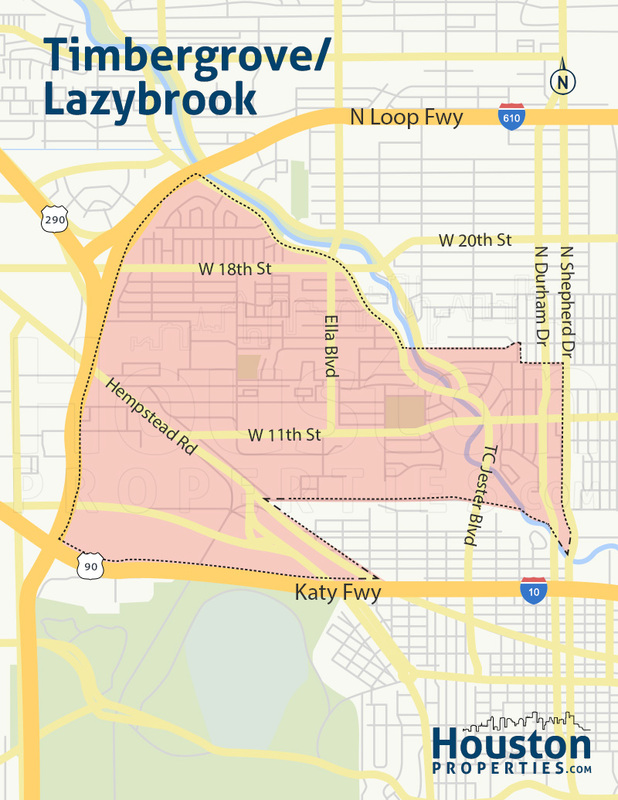 Lazybrook homes are zoned the Houston Independent School District (HISD). Sinclair Elementary, Black Middle School, and Waltrip High School all serve the community. Developed during the 1950s and 1960s, many of Lazybrook’s original ranch-style homes and traditional bungalows still stand. Some homes in the area have been replaced with newer and bigger custom-built homes. Other homeowners have opted to renovate instead of tear down. Lazybrook homes typically offer 2- to 4-bedroom floor plans, spread over 1,000 to more than 3,500 square feet. Architectural styles in the area lean more toward traditional and ranch-style aesthetics. Newer properties can feature more modern designs or Spanish- and Mediterranean-inspired architecture. Prices for Lazybrook homes for sale range from $300,000 to upwards of $800,000. Lazybrook is made up of over 600 homes, divided into 9 sections. Often tied together with adjoining Timbergrove, the neighborhood is nestled just inside Loop 610. Most of the neighborhood is north of W 18th Street, east of Loop 610, south of T.C. Jester Boulevard and west of Ella Boulevard. A small portion (Section 2) sits south of W 18th Street and west of T.C. Jester Boulevard. Each of Lazybrook’s 9 sections have deed restrictions in place, enforced by the neighborhood’s civic association. The neighborhood is mostly residential, though a few areas (specifically along W 18th and TC Jester) feature some commercial spaces and retail centers. More dining, retail, and entertainment options are available in nearby areas like the Heights, Rice Military, and the Galleria. Lazybrook homes have great access to main roads and freeways, including Loop 610, Northwest Freeway, TC Jester Boulevard, W 18th Street, and Ella Boulevard, among others. 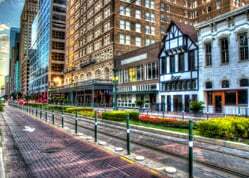 Key districts like downtown Houston and the Galleria are minutes away from the neighborhood. Lazybrook homes are zoned to the Houston Independent School District (HISD). Sinclair Elementary at 6410 Grovewood Ln. Sinclair Elementary is a Communications magnet school that centers on developing its students’ oral, written, and visual communication skills. Students can participate in courses on TV/Video/Movie Production, Multimedia/Publishing, and Drama/Broadway/Production. Frank Black Middle School at 1575 Chantilly Ln. Black Middle School, named after a foremost educator, was established in 1957. It is a Vanguard magnet school with a wide variety of athletics, academics, and fine arts programs. Several elective courses are also offered at Black. Waltrip High School at 1900 W 34th St. Waltrip High School is one of the Houston ISD’s magnet schools offering the Research and Technology magnet program. It opened its doors in 1959, and was named for a former school principal, Stephen Pool Waltrip. The following are some of the more notable private schools near Lazybrook. To find an updated listing of all Lazybrook real estate zoned to any specific public school, please send an email to Paige Martin at Paige@HoustonProperties.com with the property preference and budget that you’re working with. The median sales price of Lazybrook homes is at $400,000. Several factors contribute to the neighborhood’s continuing popularity, including its quiet suburban vibe, affordable homes, and great location. 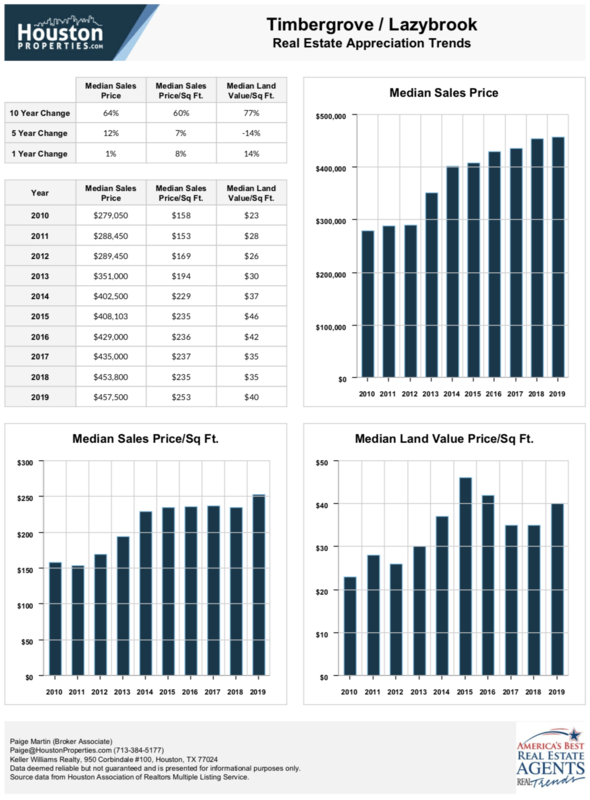 For updated information regarding Lazybrook real estate pricing and trend analysis, please contact Paige Martin at Paige@HoustonProperties.com. Lazybrook is mostly made up of ranch-style homes and traditional bungalows, many of which date back to the 1950s and 1960s. Homes in the area typically offer 2- to 4-bedroom floor plans, spread over 1,000 to more than 3,500 square feet. Lot sizes are mid- to large-sized (by Houston standards), ranging in size from 6,000 to around 14,000 square feet. Mature trees often adorn Lazybrook homes. Attached two-car garages and well-kept lawns are common features. Some Lazybrook homes also feature swimming pools and spacious front and back yards. Some of the most expensive Lazybrook real estate are new construction custom-built homes or large, updated vintage properties. Lazybrook homes for sale can start at around $300,000 and can get up to $800,000. Most of the homes for sale in Lazybrook are detached single-family properties. There have been a number of townhome developments in surrounding areas, including Heritage Creek, Timbergrove Heights, Timbergrove Terrace, Timbergrove Point, and Timbergrove Gardens. These upscale townhome developments are typically priced between $250,000 to $500,000. There are currently no residential mid- and highrise building in Lazybrook. However there are condo buildings within or near the 77008 zip code, including a few within the historic Heights (1111 Studewood Place). 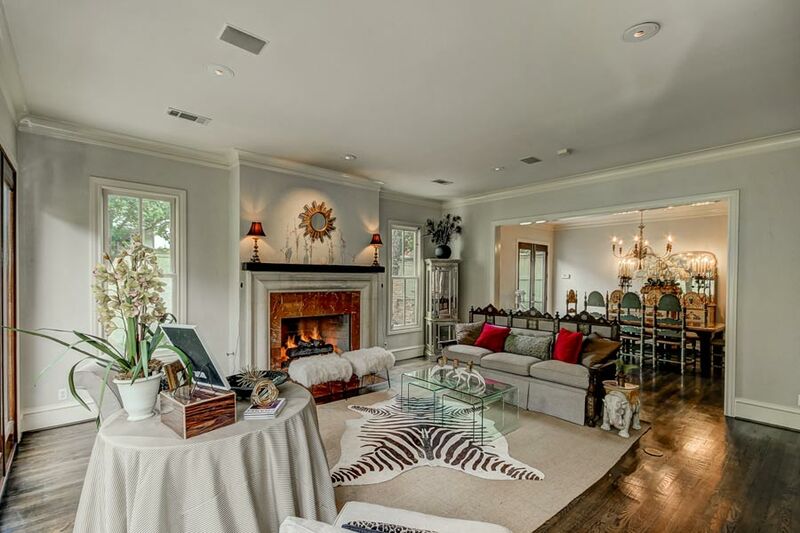 Other options are available in nearby areas like Memorial, Downtown, and River Oaks. Listed below are some of them. Named after the White Oak Bayou which forms the neighborhood’s eastern boundary, Lazybrook is one of Houston’s “late-bloomers”. During the early 1940s and 1950s, Lazybrook remained largely wooded and undeveloped. Development of the major Houston freeways spurred the neighborhood’s suburban growth. Back in the 1800s, German farmers originally owned the Lazybrook and Timbergrove area. It was also the site for a major oil discovery during the 1930s. Eureka Yard (a nearby railroad yard) and St. John’s German Lutheran Church (one of the first churches built in Houston) serve as a reminder of these years. Both landmarks remain standing today. Similar to many Inner Loop neighborhoods, Lazybrook underwent major residential and urban development in the 1960s and 1970s. About 20-30 years ago, many young professionals started to buy the ranch-style homes in the area. Some built newer, more modern homes while others opted to renovate them. Real estate developers also started numerous townhome projects around Lazybrook. Among these townhome developments are Heritage Creek, Timbergrove Heights, Timbergrove Terrace, Timbergrove Point, and Timbergrove Gardens. Residents founded the Lazybrook Civic Club in 1960. The organization’s main goal is to enforce “any and all building restrictions and to advocate and bring about improvements that will be conducive to the progress of the community and the well-being of its citizens”. The Civic Club is an active and volunteer-based group. Today, Lazybrook is a quiet but sprawling neighborhood with 9 sections. The 9 sections map out the neighborhood’s deed restrictions, paving the way for a well-developed community. While most of the Lazybrook neighborhood is residential, there are plenty of retail, dining, and entertainment options nearby. Northwest Mall is located just across the Loop along Hempstead Road. Jester Village Shopping Center sits closer to home, located along TC Jester Boulevard and W 18th St.
For more options, residents can take a short drive to nearby districts like the Galleria, the Houston Heights, and Rice Military. For outdoor entertainment, residents have plenty of options nearby. Jaycee Park and West 11th Street Park are popular options, along with the White Oak Bayou Trail. Jaycee Park is located just a few blocks away from Lazybrook homes. Recently renovated through the efforts of Friends of Jaycee Park (and the surrounding neighborhoods’ civic groups), the park now features a basketball court, tennis courts, a walking trail, a water playground, picnic tables, and a playground. The lush 20-acre area north of West 11th Street is a nature park, home to several species of birds and butterflies. The wooded park showcases a walking trail, spots for birdwatchers, and benches for simply admiring the park’s lush surroundings.